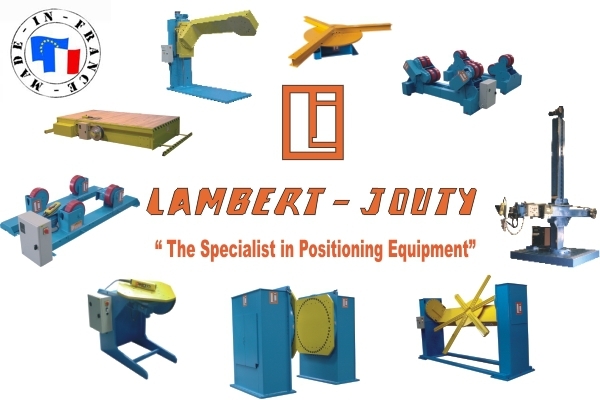 For more than 40 years, Lambert-Jouty is the specialist for the design and the realization of heavy equipment in positioning and handling on the ground, such as conventional turning rollers and self aligning turning rollers, positioners 2 axes or with 3rd hydraulic axis, positioners with square or supports, manipulators with fixed or adjustable height, turning table, welding column & boom, clamping rings, joggling machines, transfer carriages. Our equipment largely allows a gain of productivity by facilitating the operations of turning or setting in position in space, while improving safety, specially if the parts carried out by our customers are heavy and/or voluminus. Our range of standard equipment answers many applications. But Lambert-Jouty adapts and develops also equipment personalized according to the customer requirements.